Fired FBI acting director Andrew McCabe’s headline-making interview on CBS’ news magazine proved a TV audience grabber as well. The program ranked as the third most-watched last week with 9.7 million people tuning in, according to Nielsen figures released Wednesday. Viewership was down across the board during the Presidents Day holiday weekend, and the Sunday audience for “60 Minutes” didn’t approach its season average of 11.6 million. But McCabe’s memoir “The Threat,” about the FBI and the Trump administration, topped Amazon’s best-sellers list the day after the interview aired as part of a media blitz for the book. He told “60 Minutes” that a “crime may have been committed” when President Donald Trump fired James Comey as FBI director in 2017 and tried to publicly undermine an investigation into the Trump campaign’s ties to Russia. McCabe also said the FBI had good reason for a counterintelligence investigation into whether Trump was in league with Russia, and therefore a possible national security threat. 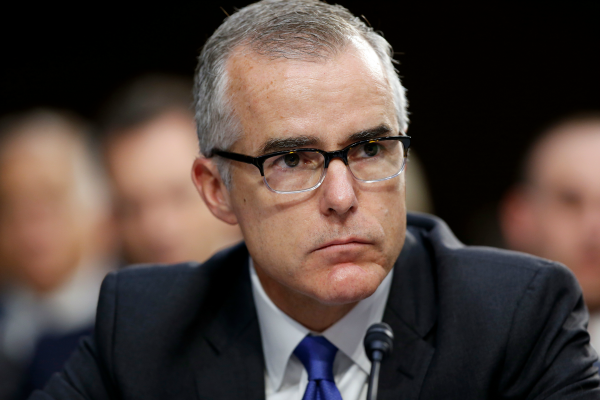 McCabe, fired from the Justice Department last year after an internal probe into a news media disclosure, denied he intentionally lied and said his firing was politically motivated. CBS won the weekly network ratings contest as viewers also devoted time to the network’s “NCIS” and “The Big Bang Theory” and their spinoffs, Nielsen said. With six of the top 10 shows and 13 of the most-watched 20, CBS had an average of 6.3 million weekly viewers. NBC had 5.2 million, ABC had 3.8 million, Fox had 3.6 million, Univision had 1.4 million, ION Television had 1.3 million, Telemundo had 1.3 million and the CW had 880,000. Fox News Channel was the week’s most-watched cable network, averaging 2.5 million viewers in primetime. TNT had 2.3 million, MSNBC had 1.9 million, ESPN had 1.4 million, HGTV had 1.35 million and History had 1.3 million. ABC’s “World News Tonight” topped the evening newscasts with an average of 9.4 million viewers. NBC’s “Nightly News” was second with 8.8 million, and the “CBS Evening News” had 6.7 million. Below are primetime viewership numbers compiled by Nielsen for Feb. 11-17. Listings include the week’s ranking and viewership. 1. “NCIS,” CBS, 13.4 million. 2. “America’s Got Talent Champions,” NBC, 10.5 million. 3. “60 Minutes,” CBS, 9.7 million. 4. “FBI,” CBS, 9.5 million. 5. “Blue Bloods,” CBS, 8.9 million. 6. “Chicago Med,” NBC, 8.7 million. 7. “Chicago Fire,” NBC, 8.5 million. 8. “The Big Bang Theory,” CBS, 8.3 million. 9. “The Masked Singer,” Fox, 7.9 million. 10. “Young Sheldon,” CBS, 7.7 million. 11. “Mom,” CBS, 7.6 million. 12. “Chicago PD,” NBC, 7.5 million. 13. “This Is Us,” NBC, 7.4 million. 14. “Hawaii Five-0,” CBS, 7.3 million. 15. “God Friended Me,” CBS, 7.19 million. 16. “NCIS: New Orleans,” CBS, 7.16 million. 17. “The Neighborhood,” CBS, 7 million. 18. “NCIS: Los Angeles,” CBS, 6.7 million. 19. “Grey’s Anatomy,” ABC, 6.6 million. 20. “MacGyver,” CBS, 6.4 million. HBO’s “Game of Thrones” lived up to the hype. This past weekend’s season premiere stands as the most-watched one-day event in the history of the cable network that began in 1978. Between the Final Four, the week’s most popular entertainment special and their usual solid shows, there was no stopping CBS this past week. When there’s a blowout in the normally tight race for cable news supremacy between Sean Hannity and Rachel Maddow, it’s best to check the political headlines to learn why. One week into March Madness, CBS is feeling good. An unusual ending to ABC’s long-running attempted love matches on “The Bachelor” paid off for the network.